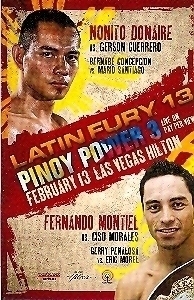 Nonito Donaire, a great Boxer from Talibon, Bohol, Philippines, Promo Card for his first defense of the interim WBA World super flyweight title at the Hilton Hotel Casino, Las Vegas Nevada, on Feabruary 13, 2010. Card is 4 X 6 inches, in mint condition. Buyer responsible for 1.00 postage within the USA. Please email for more details. Thank you for checking us out!